Today I thought I'd be one of those awesome Time Management types and get a little blogging done at work. That way, I could get to a dinner I had planned for tonight, enjoy the dinner because I wouldn't have my BEDA commitment nagging at the corner of my thoughts, and then after coming home and posting my pre-written blog, get some sleep. Well, that was the plan. But as I got my blog out in front of me and sat down to write to it, nothing happened. That is, no words started appearing on the screen, because my fingers weren't pressing keys on the keyboard, because signals from my brain weren't being forwarded to my fingers, because there was nothing going on in my brain. I was hit with blogger's block. I'm not the fastest writer in the world, mainly because I spend an disproportionate amount of time thinking about what it is I want to write about. It never was the typing that was the problem - reaching 70, maybe 80 words-per-minute if I want to risk RSI, is not hard for me - the challenge is thinking at 80 words-per-minute. I'm sure that the human brain is capable of 80-somethings per minute, but those somethings are often brain noise that go off on strange tangents. ...which in turn reminded me of that saying about how given a room full of monkeys with typewriters and an infinite amount of time (plus some other variables that would make this possible like making the monkeys immortal and having the typewriters never wear-out etc etc) the monkeys would eventually type the works of Shakespeare. So I continued to follow my failed train of thought like a bored person would follow Wikipedia links, and I stumbled across a page that summarizes a study which tried to do the above: get some monkeys, give them typewriters, and then see what happens (http://www.apologeticspress.org/articles/2340). The monkeys eventually did produce 5 pages of text (for very broad and loose definitions of 'text'), but it mainly consisted of the letter S, along with random sprinklings of the letters A, J, L and M. The scientist's response: "obviously English isn't their first language". I wasn't aiming to write the works of Shakespeare, I was just aiming to write one coherent blog post so that I could enjoy my dinner and catch-up on lost sleep! 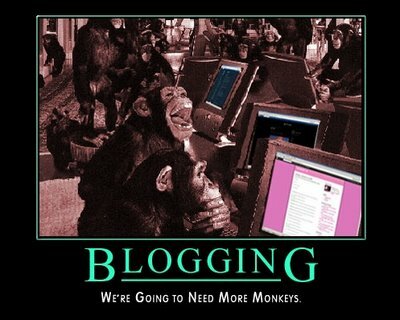 I'm just 1 monkey, with 2 computers (work and home), and a commitment to blogging every day. Surely that counts for something? Then I blinked, and realized I had written a blog post. It may not have been my usual fare, but it was a blog post nonetheless, about my attempt at managing my time better, my fear of failing my commitment to BEDA... and pooing monkeys. I guess that 80-somethings-per-minute of brain noise is good enough for writing a blog after all.